All war is murder, robbery, trickery, and no nation ever escaped losses of men, prosperity and virility. War knows no victor. From his last public address in Palo Alto, California (30 July 1928), as quoted in 'David Starr Jordan Dies at Age of 80', New York Times (20 Sep 1931), N6. 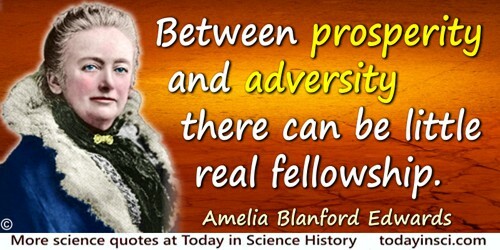 Between prosperity and adversity there can be little real fellowship. In novel, Half a Million of Money (1865), Vol. 2, 6. By God’s mercy British and American science outpaced all German efforts. … This revelation of the secrets of nature, long mercifully withheld from man, should arouse the most solemn reflections in the mind and conscience of every human being capable of comprehension. We must indeed pray that these awful agencies will be made to conduce to peace among the nations, and that instead of wreaking measureless havoc upon the entire globe, may become a perennial fountain of world prosperity. Statement drafted by Churchill following the use of an atomic bomb on Hiroshima. Due to the change in government, the statement was released by Clement Attlee (6 Aug 1945). In Sir Winston Churchill, Victory: War Speeches by the Right Hon. Winston Churchill (1946), 289. Our civilization is an engineering civilization, and the prosperous life of the large population, which our earth now supports has become possible only by the work of the engineer. Engineering, however, is the application of science to the service of man, and so to-day science is the foundation, not only of our prosperity, but of our very existence, and thus necessarily has become the dominant power in our human society. In 'Religion and Modern Science', The Christian Register (16 Nov 1922), 101, 1089. The article is introduced as “the substance of an address to the Laymen’s League in All Soul’s Church (5 Nov 1922). Letter printed in Engineering Magazine (Jan 1917), cover. Quoted in an article by Meyer Bloomfield, 'Relation of Foremen to the Working Force', reproduced in Daniel Bloomfield, Selected Articles on Employment Management (1919), 301. The expenditure [on building railways] of £286,000,000 by the people has secured to us the advantages of internal communication all but perfect,—of progress in science and arts unexampled at any period of the history of the world,—of national progress almost unchecked, and of prosperity and happiness increased beyond all precedent. The future of humanity is uncertain, even in the most prosperous countries, and the quality of life deteriorates; and yet I believe that what is being discovered about the infinitely large and the infinitely small is sufficient to absolve this end of the century and millennium. What a very few are acquiring in knowledge of the physical world will perhaps cause this period not to be judged as a pure return to barbarism. In 'News from the Sky', Other People’s Trades (1989), 23-24. The Pacific coral reef, as a kind of oasis in a desert, can stand as an object lesson for man who must now learn that mutualism between autotrophic and heterotrophic components, and between producers and consumers in the societal realm, coupled with efficient recycling of materials and use of energy, are the keys to maintaining prosperity in a world of limited resources. 'The Emergence of Ecology as a New Integrative Discipline', Science (1977), 195, 1290. The progression of physical science is much more connected with your prosperity than is usually imagined. You owe to experimental philosophy some of the most important and peculiar of your advantages. It is not by foreign conquests chiefly that you are become great, but by a conquest of nature in your own country. From an introductory lecture to a course on electro-chemical science in 1809, quoted in 'Extracts' in J. Davy (ed. ), The Collected Works of Sir Humphry Davy (1839-40), Vol. 8, 358. The road to happiness and prosperity lies in an organized diminution of work. In Praise of Idleness and Other Essays (1935), 12. Unless we practice conservation, those who come after us will have to pay the price of misery, degradation, and failure for the progress and prosperity of our day. We may fairly judge of the commercial prosperity of a country from the amount of sulphuric acid it consumes. Familiar Lectures on Chemistry (1843). Breaking New Ground (1998), 505.